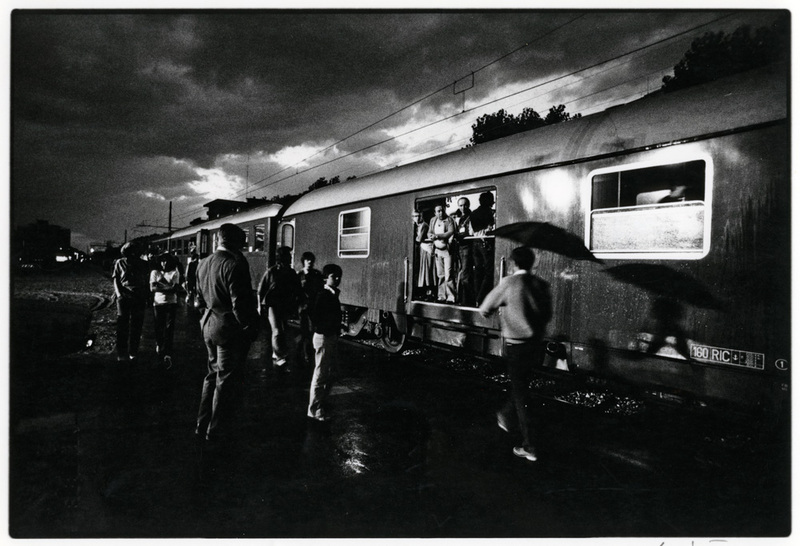 In the sixth installment of the ongoing series Art (re)Collecting, the Walker’s director emeritus Martin Friedman—who passed away in 2016—recalls a 1978 trip to Bologna to witness Il Treno, a John Cage happening on a moving train. The essay has been edited for clarity. 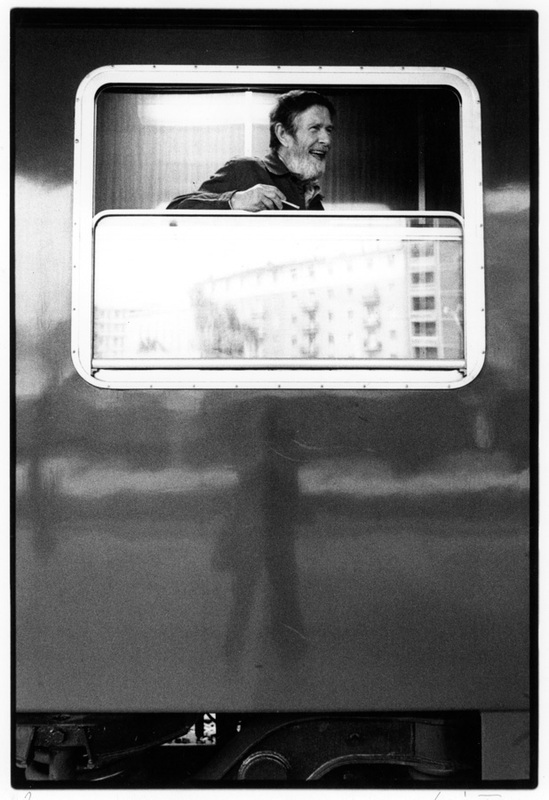 On June 26, 1978, a three-day event that began in the Bologna Centrale train station added an idiosyncratic episode to that city’s rich cultural history. Its catchy title was Il Treno di John Cage. Its lengthier, official appellation was John Cage’s Train. In Search of Lost Silence. Three Excursions for Prepared Train. Variations on a Theme by Tito Gotti. 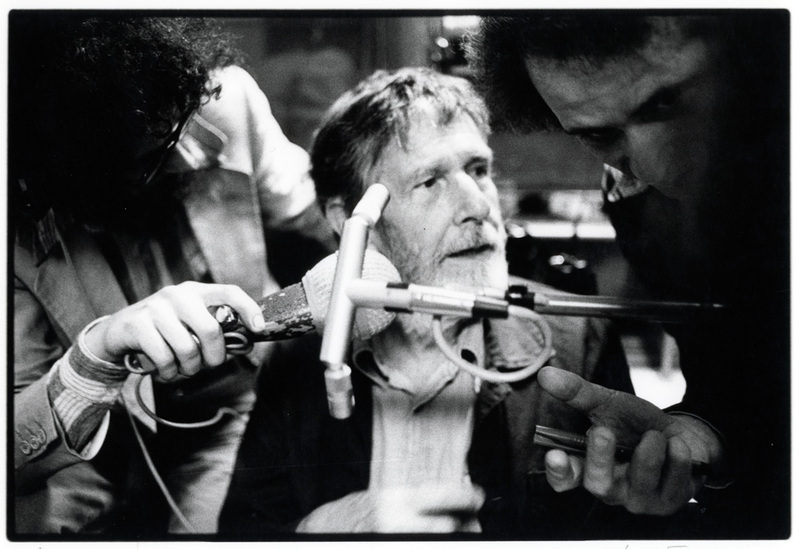 By John Cage, with the Assistance of Juan Hidalgo and Walter Marchetti. 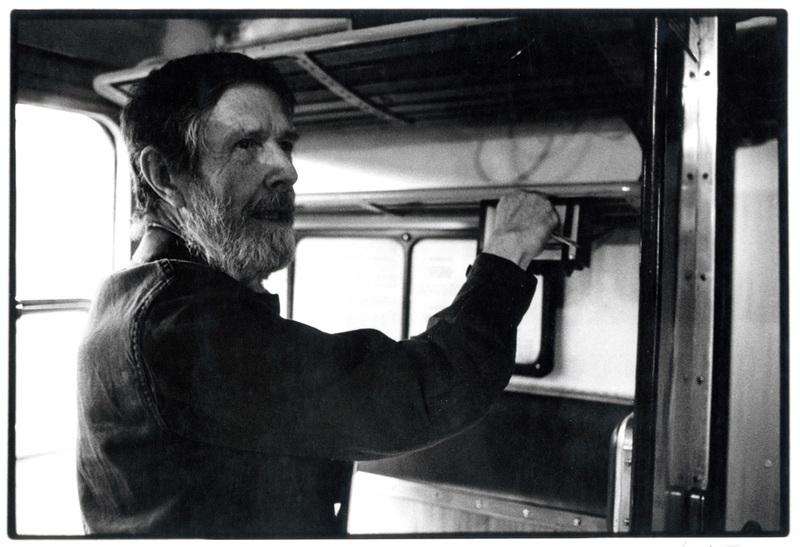 As longtime friends of John Cage and admirers of his work, my wife Mickey and I headed for Bologna to learn what he was up to. No two of his public projects were ever alike. He was full of surprises. His musical projects often occurred in unlikely places, for example, in sports arenas. But this would be his first artistic venture on a moving train, and a “prepared” one, at that. The venerable city of Bologna has had ups and downs throughout its history. A city in constant evolution and a battlefield for innumerable warring factions, it was first called Felsina when it was an Etruscan capitol and stronghold. It was overrun by Gauls in the first century B.C. The Gauls, in turn, were expelled in 189 BC by the Romans, who renamed it Bononia. By the thirteenth century the city was a pawn in pan-European politicism, as attested by the struggle there between the Guelphs—loosely speaking, supporters of Papal rule—and the Ghibellines, supporters of the Holy Roman Empire. There were occasional moments of relative tranquility, and in 1088 the University of Bologna was founded. A major cultural center, in its heyday it rivaled Florence and Rome. Bologna’s painters in the late 16th and 17th centuries were leading exponents of Baroque form-modeling chiaroscuro technique. From the early 18th century to the French Revolution, Bologna existed more or less serenely under the Holy See. For all the red flags aflutter and revolutionary turbulence following World War II, Bologna sought to present an untroubled view of itself to the world. That view was of a welcoming city open to ideas that were artistically advanced. Hence evolved the highly visible role of the Teatro Comunale, a locus for creative new approaches to the arts. So open to new ideas was the city that it was the major supporter of as radical an enterprise as Il Treno di John Cage. The mission of the train, according to its young Italian originators, was to journey into the uncharted realm where everyday sounds and manufactured ones could juxtapose and combine to generate new auditory experiences. No small ambition, but the musical train’s intrepid organizers were courageous true believers. 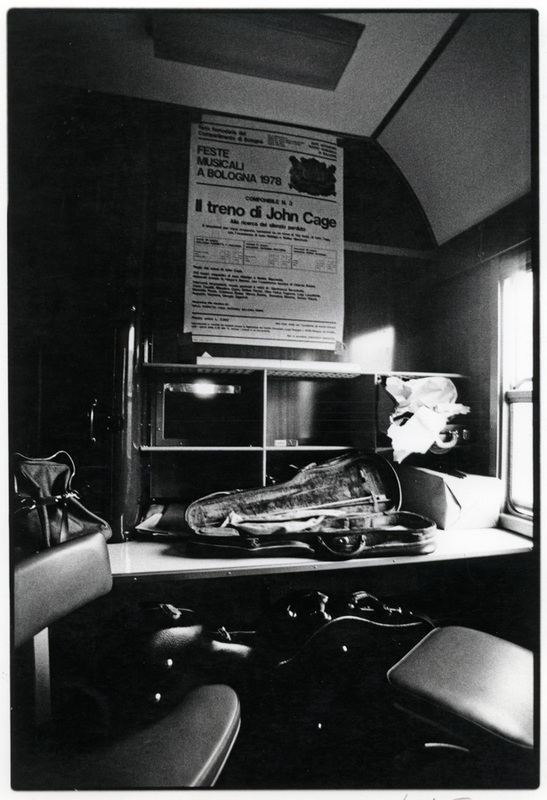 Although it was John Cage whose life work and all-accepting attitude about found sound inspired Il Treno, it was Tito Gotti, an enterprising Bolognese impresario employed by the Teatro Comunale, who put forth the idea of a musical train. A “happening on wheels,” as it were. Prior to that venture, Gotti’s job included finding unusual performance sites in Bologna, ideally with a musical history, no matter what kind of music. He scoured the city for unused churches, abandoned theaters, and concert halls that could serve as settings for new music offerings. 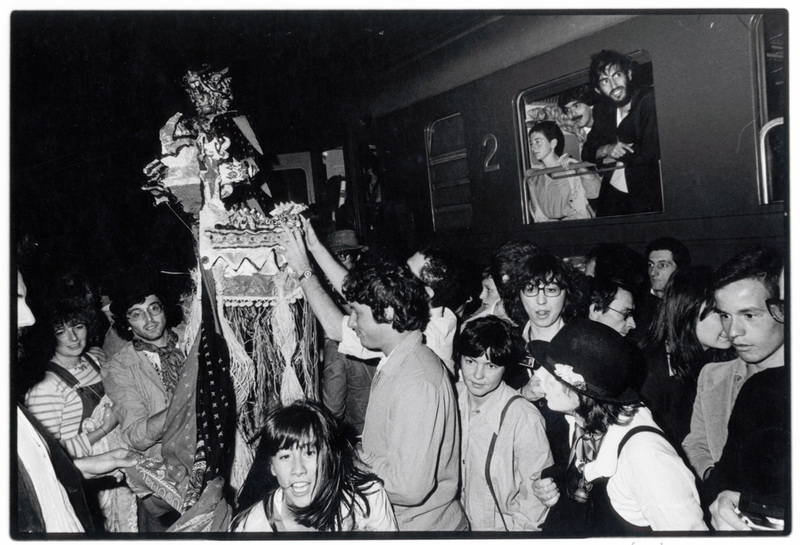 For the 1978 project [of the annual Feste Musicali, founded by Gotti in 1967] Gotti was determined to do something he had been thinking about for years: a musical event on a moving train. He decided that having an internationally known exponent of contemporary music—in short, a well-known authority figure—would attract international audiences and give the project credence. Who better than John Cage, the elder statesman of modern music? No one, Gotti thought, so he set about recruiting that legendary personality. He knew Cage’s work, having seen performances in Bonn and Milan and, judging from audience reactions to these, was well aware of what he would be getting into. However, despite many letters and phone calls to Cage, Gotti was unable to recruit him—not until December 1977, when a mutual friend, the young pianist and conductor Marcello Panni, arranged for them to meet in Milan after a Cage reading at the Teatro Lirico. Seated at a bare table, Cage read—or rather intoned into a microphone—passages from the journals of Henry David Thoreau, the 19th-century American Transcendentalist. The program was titled Empty Words, and as Cage read on the audience grew restive. Not only had he selected an obscure subject, from their point of view, but he had also altered the text by applying the principles of The I Ching to select certain words or phrases by “chance.” He turned Thoreau’s already dense text into unintelligible words and phrases. What the audience heard was something approximating a ritual chant, rather than words that made sense when strung together. The reception of Cage’s reading could not have been worse. Mutterings in the audience soon turned into hoots, jeers, and catcalls, but an undeterred Cage read on. Gotti was among the few who stayed the course. 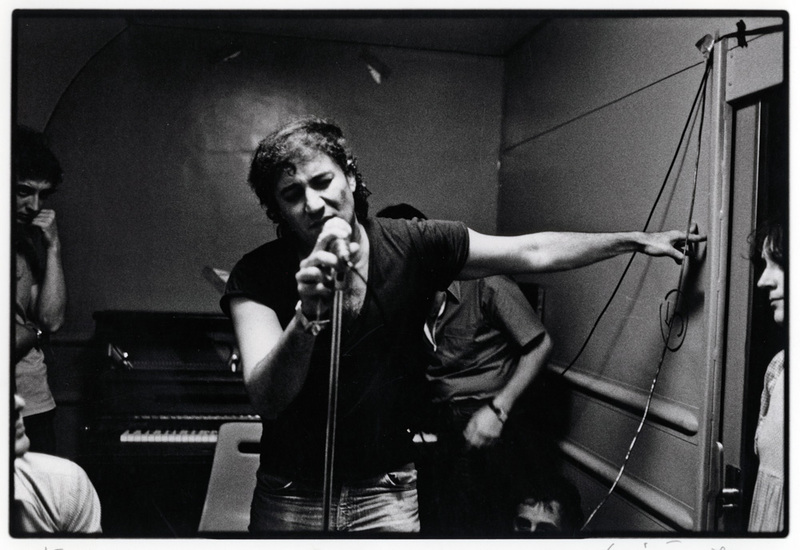 When he met Cage later, he again sought to enlist him in the musical train project. The train, he told Cage, would be filled with musicians and electronic music equipment. It would make stops at designated towns and be welcomed enthusiastically by local populaces. So persuasive was Gotti that Cage agreed to come to Bologna where Gotti introduced him to the young composers Walter Marchetti and Juan Hidalgo, whom he had already persuaded to work on the project. The next objective was to have Cage help him choose the right train. This took place on a wintry day during their visit to a train station. Gotti recalls Cage gamely walking from one snow-covered platform to another in his “raggedy shoes.” After considering several possibilities, Cage and Gotti decided to look for simpler, unadorned cars. The idea was to look for bland neutrality. As Gotti makes clear in his essay in Il Treno di John Cage, published by Baskerville Art Books in Bologna, this was an audition process. Not every train would qualify. So pleased was Cage with the various noises the train made and the possibilities of synthesizing and amplifying them that he agreed to participate. He told Gotti that he would write to him stating his requirements with respect to musical personnel and sound equipment that the chosen train would carry. This would be quite specific and deal with everything from music to be played in the train station to music and other sounds aboard the train, and to the auditory experiences at each stop the train would make. It would deal with the use of live performers, recorded music, and sound equipment to pick up train noises. He would also suggest what would take place as the train made various stops. Cage’s letter became the template for the project. When Cage returned to New York, Gotti set about borrowing a train from the National Railways and gathering a phalanx of young performers, from instrumentalists to vocalists. He assembled a core of musicians familiar with electronic gear. He made arrangements for the train’s receptions in the various towns along the route. The passengers, according to Gotti and his cohorts, would experience the juxtapositions of man-made and mechanically generated sound. A “prepared” train, as envisaged by Cage and his young Italian confreres, would be a large-scale equivalent of Cage’s “prepared piano,” but one in motion. The piano, its strings wrapped in rubber strips and gripped by C-clamps and other sound modifiers, could produce sounds from delicate to bombastic. Similarly, unexpected sounds could be coaxed from parts of the moving train by means of microphones and synthesizers. Even the sounds of the flushing toilet might be part of the auditory mix; nothing was sacred. Gotti’s borrowed train included cars from the National Railways, two with no compartments, so that they could be used for chamber ensembles. Passengers could visit them. Moreover, he arranged for musicians and vocalists to perform in the cars. Some musicians, invited to take part in the project by Cage and Gotti personally, enjoyed unrestricted freedom and could play whatever music they wanted. At each of the prearranged stops the train was greeted by outpourings of townspeople. 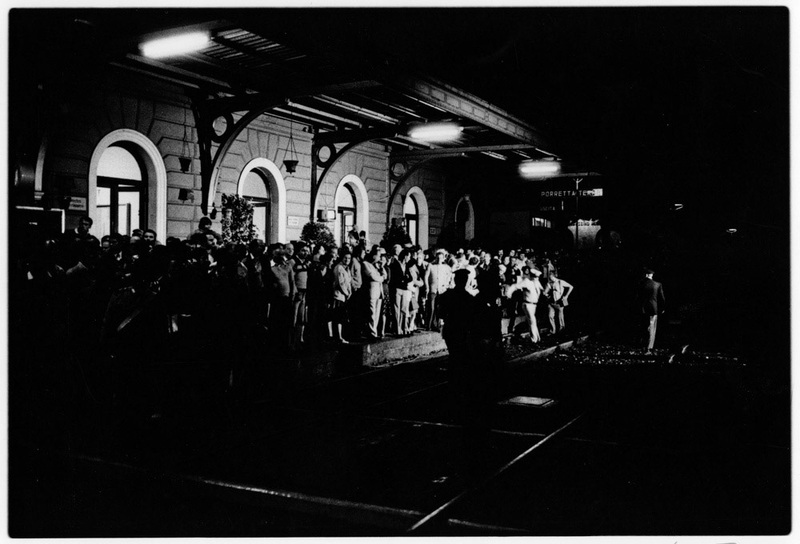 Local bands, folk dance groups, and other ensembles were waiting on the platforms, and soon passengers disembarked to join them. The atmosphere was carnival-like. In a way the moving train theme brought to mind the industrially inspired imagery of powerful, fast-moving trains and planes—subject matter favored by the early 20th-century Italian Futurist painters Boccioni, Severini, and Balla. Like Gotti, Hidalgo and Marchetti were ardent Cageophiles. As Gotti was an impresario, not a composer, I asked him why Il Treno’s title included “Variations on a theme by Tito Gotti.” Gotti’s reply was that Cage took a broad view of the word “theme”—it need not be a musical theme but could be an idea—and he felt that Gotti should be credited for conceiving of Il Treno. By early spring, word about Il Treno di John Cage was widespread. The city of Bologna was covered in posters advertising it, and enthusiasm continued to build. 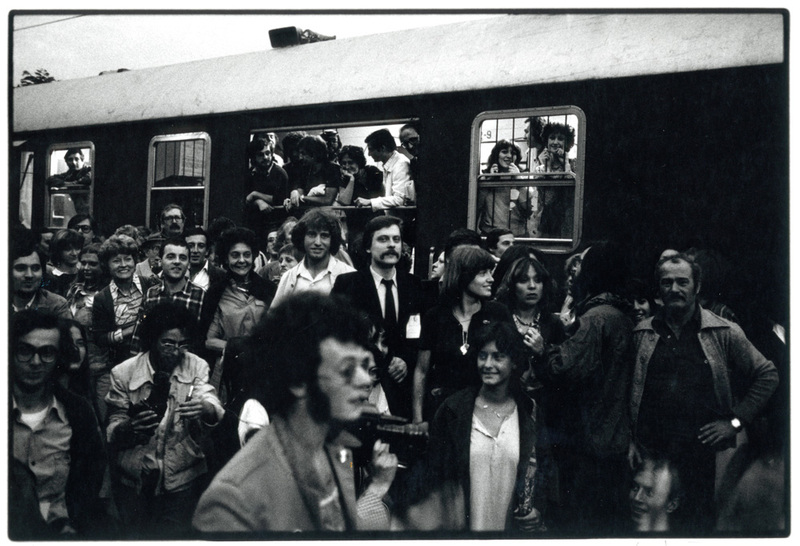 On June 26, 1978, the first of what would be three round trips to destinations around Bologna took place. Each trip would leave from and return to a different station. That first day, the Bologna Centrale station was teeming with musicians performing solo and in ensembles. Passengers from near and far converged at the station that sultry summer afternoon. They walked along the train platform looking for their wagons. Once inside their compartments, they settled back for the journey. Some said goodbye to well-wishers on the platform, others waved through open windows. My wife and I familiarized ourselves with the sound and video monitors in our compartment. A smiling, shaggy-haired Cage, in horn-rimmed glasses, accompanied by a retinue of admirers strolled through the cars warmly greeting friends and strangers. As the picturesque Emilia-Romagna panorama of tile-roofed villages and verdant farmland rolled by, passengers could switch channels to hear amplified train noises or prerecorded music from the towns and villages where the train stopped. Some of the train’s musicians began strolling the cars, plying their trade. The performers ranged from mimes to vocalists, such as the eminent Greek Stratos, who sang in what seemed like a number of voices. Fixing his eyes on various passengers he vocalized in what sounded like several voices at once: from a deep rumbling noise to a wailing falsetto. Il Treno di John Cage made its first stop at the little town of Riola, where a wonderful sight greeted us. Surely, all of Riola turned out in our honor. At trailside a Carabinieri [police] band played stirring marches. Choral music and folk songs were sung by sturdy Alpini [alpine infantry corps] in feathered caps. A village orchestra played romantic waltzes. According to Oderso Rubini, a sound engineer who participated in the project by prerecording folk and other music of the towns and villages to be visited by the train, this greeting—for all its spontaneity—had been carefully planned. 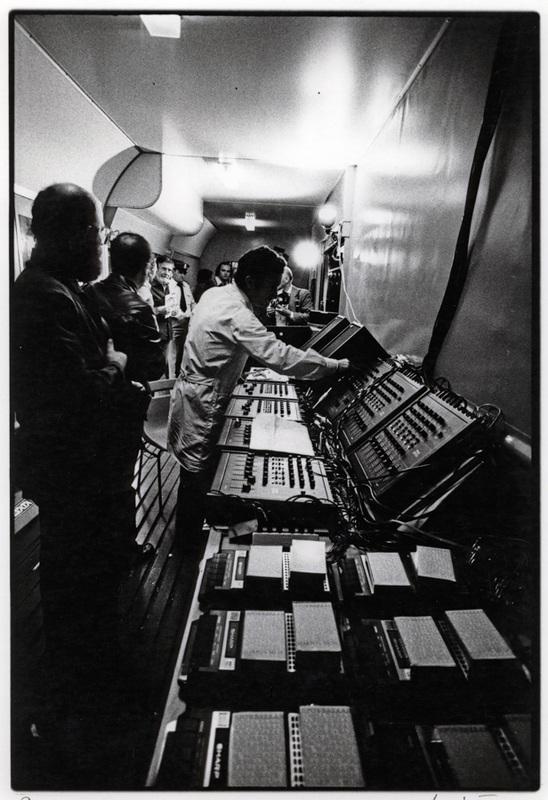 Rubini had worked for a month before the event with composers Walter Marchetti and Juan Hidalgo, selecting the best of his recorded gleanings for use in preparing audio cassettes (30 for each station) that would be played through loudspeakers mounted atop each train car. When the train pulled into each of the local stations the speakers blasted forth the sounds that Rubini had recorded. News of the musical train had spread up and down the routes it would travel over its three-day existence. Everyone could participate in the festivities. Gotti and his friends had planned every detail carefully following Cage’s instructions in the now famous letter. In Riola many of the performers aboard the train had descended with the passengers to join the welcoming crowd that late afternoon. So cordial was our reception, so much wine and other refreshments were available that it was difficult to tear ourselves away, but the train was already behind schedule. The next and last stop was the village of Porretta Terme. More bands awaited us, as did more dancing with energetic villagers. However, the crowd was sparser except for some new elements. The harsh sounds of rock music drowned out more dulcet ones. 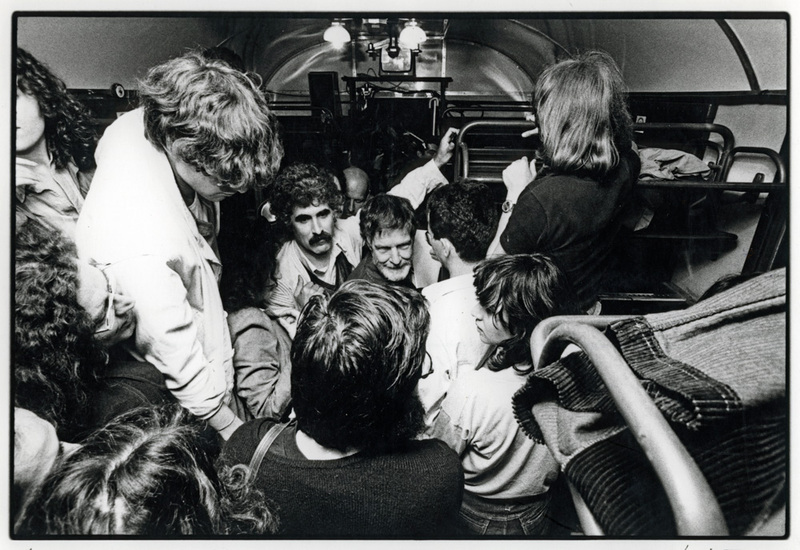 A number of boisterous young men shouted “John Cedge, John Cedge!” and began climbing on the train. They came up the stairs and through open windows. Some parked themselves on the luggage racks above the passengers’ compartments. Cage, in another car, surrounded by friends who now became protectors, was smiling nervously as the invaders began beating on the train walls with more shouts of “John Cedge,” for the free ride back to Bologna. Unlike the journey from the city, the return leg of the trip had a far darker character. The Porretta visit and subsequent ride back to town were the opposite of the journey there. Though we were met with bands, orchestras, and folk dancing as we arrived in Porretta, the crowds were smaller, the greetings more restrained. Everyone was tired, including the citizens of that little town who had waited for the much-delayed arrival of the train. It did not help that food and wine had become scarce in the gathering darkness. The train-side welcoming music took on a harsher tone. Among greeters milling about were a knot of surly-looking young men. They appeared to be well into the local happy hour. Hard-rock music blared over occasionally audible fold-dance ditties. Presumably, most of the village bands had long dispersed, leaving the field to rough, rowdy, drunker types. What was this all about? After all, the train ride was to be a joyous affair. Disruptors along the way, yes, if taken as part of the experience, but threats from the outside? No one had thought in those terms. Neither had anyone thought of providing boxes of food—sandwiches, small bottles of wine, possibly a container of pasta for passengers sure to be hungry. The coincidence of hunger pangs and arrival of local louts eyeing the train for possibilities of a little fun decidedly changed the dynamic of the musical journey.